Beautifully designed leader's kit containing everything you need to run this visually stunning new outreach course. Life Explored will help people uncover what they’re really living for, and shows how, in Christ, God meets our deepest desire for happiness. Each session explores an aspect of God’s character. We see that the God of the Bible is good, trustworthy, generous, liberating, fulfilling, life-giving and joyful. And ultimately we see that the greatest pleasure in life is enjoying God himself. This exciting, new outreach course can be run before or after Christianity Explored or Alpha and is perfect for anyone looking for answers to life's big questions. It will also provoke good discussions among those who know and love Jesus. 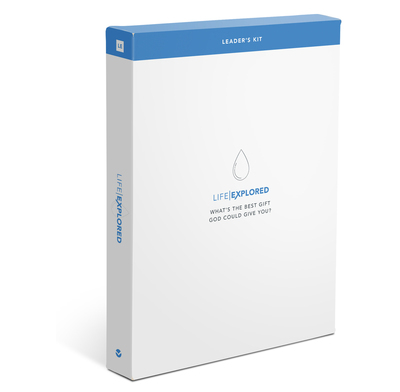 This Leader's Kit contains everything you need to run your course - a leader's handbook, a guest handbook, a DVD and a code to download digital copies of the video sessions, giving you flexibility to run it one-to-one, or in larger groups; in churches, or in homes. The DVD features 13 subtitled languages; English SDH, Simplified Chinese, Dutch, French, German, Italian, Japanese, Korean, Spanish, Polish, Portuguese, Romanian and Russian. We're working with our translation partners on translating the course handbooks but these will take longer to complete. Please see our translations page for further information. Gold part 1: The Californian gold rush. A prospector risks his life in the quest for gold. What keeps you going in difficult situations? Gold part 2: Explores Genesis 12. Lawn part 1: Suburbia. A man is hooked by a late night infomercial and feels his life would be complete if only he could have the perfect garden. What's your “if only”?